You are currently browsing the category archive for the ‘science fiction’ category. The LADEE which graced our skies Sept 6th, 2013 will have the fastest internet anywhere…. It could download a full length move in under a minute… For a while at least. That is until the bandwidth gets filled up with pesky ads. The internet will be abuzz with posts shortly. The excitement was great. No one knew if it would pass. It did. Melanie _____.______. Smith (lol) Girl you did it. Hats off to a rather well crafted bill designed to make it through. You earned your bottle of wine tonight. Bryan Townsend is amazing.. A Patrick Henry when it comes to what is just. I kept seeing Tony Deluca in that position, knowing full well we would have an entirely different outcome had it been so. Clothier, Marshall and Bushweiller had tough choices.. out of a thousand voices in their ear, they chose to hear the right ones. We are so small standing next to them. Karen Peterson rocked the house. “If my happiness somehow demeans or diminishes your marriage, you need to work on your marriage” certainly seems like it would apply to Senator Venables. That dude has some work to do….. In this hearing and vote, it becomes very clear. If you look straight into the heart of America, each and all the values we grew up under, the Democrats embody. The evil that also lies in America, is Republican to the core… Never in my lifetime did I expect to see people use God to promote bigotry. For as the vote was failing, as the house of sticks was crumbling around them, as they worked themselves into a fever pitch to make one last gasp to undo the damage, the clear, unadulterated hatred, the pure crystal of evil burned from underneath their skin. Hatred. Hatred at all these people was their fuel. Because I saw it staring back at me on the floor of the Delaware Senate. It was in each of those Republican’s eyes as they got up and tried to embarrass, put down, demonize an innocent group of people they deemed inferior, beneath them, slovenly, trash. It was in the eyes of every fake pastor or priest to got up to twist God’s word in such a way as to demean the very one whose words they praise on Sunday. This is the undercurrent of America we don’t like to talk about. This is the sewage that come with building a society. This is America’s most horrible accomplishment. The underbelly of our just laws and our freedom to say or do what we please. There are people who only gain worth by putting others down, and because they are Americans, they have every right to do so. Prejudice will continue. Seeing it in person was unnerving. Seeing it for real made one sick. We have a real problem in our country, One that must be put down like a poisonous snake… Sure we can live with it. But one day it will bite us, or even worse. Our children…. But today, we beat them. Like George Wallace in the schoolyard doorway, they showed America the stinkin oafs they truly are…. And lastly. Bethany Hall- Long….. Oh my… it takes great courage to stand up to one’s enemies… It takes even greater courage… to stand up to one’s friends…. Most people are unaware there are more NASA launch sites other than Cape Carnaveral. But listed as the newest one is the Mid-Atlantic Regional Spaceport (MARS), Delmarva Peninsula, Virginia which is located on Wallops Island in conjunction with NASA’s Goddard Space Center. (Most of you know, Wallops Island is just south of Chincoteague)..
Wallops Island was our nations first space launch site. It was established in 1945 by the Langley Research Center as a pilotless aircraft research station. It was incorporated by NASA in 1959. It has always been the small boy of the three launch sites. In the initial days, is was in hot contestation against Cape Canaveral for the becoming the main launch site. The difference in winter temperatures decided the issue. As an aside Delawareans should be interested to note, that the first seven Nazi rocket technicians of arrived in the United States at New Castle Army Air Field, just south of Wilmington, Delaware, on September 20, 1945. They were then flown to Boston and taken by boat to the Army Intelligence Service post at Fort Strong in Boston Harbor. Later, with the exception of von Braun, the men were transferred to Aberdeen Proving Ground in Maryland to sort out the Peenemünde (the Nazi Rocket base) documents, enabling the scientists to continue their rocketry experiments. In 1998, the Virginia Commercial Space Flight Authority, later joined by Maryland, built the Mid-Atlantic Regional Spaceport at Wallops on land leased from NASA. In December 2006, the facility made its first launch. 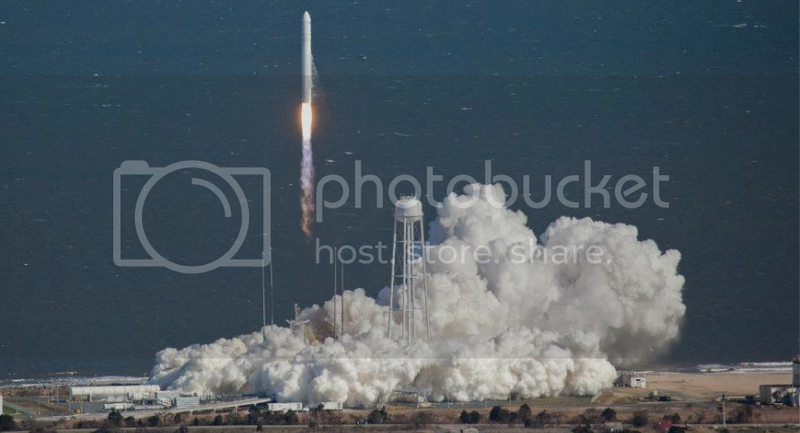 It was from here yesterday’s successful launch occurred…. The launch sets the stage for a second company to begin resupply missions to the International Space Station. California-based SpaceX became the first private firm to officially resupply the ISS last October. Its Falcon 9 rocket lifted off from Cape Canaveral in Florida carrying a Dragon capsule filled with cargo and science experiments. Today, Antares, built by spaceflight company Orbital Sciences of Dulles, Virginia, lifted off from the Mid-Atlantic Regional Spaceport on Wallops Island, Virginia, at 22.00 GMT (Sunday, April 21, 5 pm).. This was just a test carrying a dummy payload corresponding to the weight and proportions of its Cygnus payload. But while Dragon can return from its missions loaded with cargo, no Cygnus craft will ever make it back to Earth. These craft will leave the ISS filled with trash and will burn up in Earth’s atmosphere. The next test is in June, and if all goes well, 8 flights have been contracted to occur over the next 3 years. Unfortunately even though it is only 130 miles south, it cannot be seen from Delaware during the day, nor heard. However 21 minutes after launch a very low level rumbling of distant sonic booms were alleged to have been heard here in Northern Delaware. But, of all places… Sleepy Delmarva. How cool is that? In the ’90’s as these ideas were first proposed and debated upon their merits, but there was no evidence; it was all theoretical.. Now, we have actually done it and are getting hard data…. Here is their history in one paragraph. If a charter school opens up in a failing school system and the public money per student is allowed to follow that child, obviously parents at no cost to themselves will opt to put their children in a charter school. Simply put, if their public school is rated “F”, the charter school can be no worse. So the charter School being someone’s private investment, now begins accepting children with public school money that comes from citizen’s assessed property taxes… As more charter schools open up in that same failed district, they siphon even more public money into these private enterprises, pulling it of course out of the public school system in that local area. So the public school which was previously failing, is now accepting a much lower number of students, yet trying to maintain the same infrastructure covering that wide geographical area.. For example, its school buses have to run the same routes whether they receive cash per student to carry 5 students or 35… Obviously the public schools have to do with less, while the charter schools have to do with more… The charter schools choose their students in certain cases, and can send them back to public if they don’t meet expectations. The Public schools must take whomever is left, in. Gradually the quality and sheer numbers of students deteriorate so much, that these public schools have to be shut down. Too many schools are too empty and that is too costly… Consolidation must occur. Philadelphia and Chicago are closing schools. And Guess what? Most of both are black. The argument can be made that we are accidentally closing the door on the only one way a person can pull himself out of the inner city quagmire: with a quality education…. Now let us back up. The argument for charter schools was that they would provide that door or that opportunity for these citizens to help pull themselves out. Theoretically, if all charter schools had huge success stories, then this plan could be a viable option. If such were the case, all of us including myself would be in favor of charter schools… As I look back over the past 20 years I can now see how we were seduced into allowing them to happen. If someone had substituted the word “private schools” instead of “charter schools”, no one would be against; we’d all be in favor….. private schools (which used private funds), competing with public schools would be a good thing. People would have a choice if they could afford to let their children get a great education or a good one… I think Britain has functioned fine with its Eton School for Boys. Then, when the argument became enhanced, that drawing such a line financially was not fair to underprivileged children who had talent, a lot of us felt that yes they should receive scholarships to go to good schools, and that was fair. Then, when the lack of scholarships for the amount of private school openings became apparent, all were lulled into letting the public money for that child, follow the child where he wound up going… even if it was outside the school system and into someone else’s private pockets…. Allowing public money to enhance private pockets, particularly in a urban environment where lots of potential students surround a converted building, opened up great possibilities for some to get wealthy… Just a hundred students at $15,000 each per year, could bring one a gross of $1,500,000.. One could squeeze that few into just three rooms of 35 students… Double that, and one gets $3 million. Do it across the city, and gross $100 million…. So is it really that bad for someone to get wealthy IF… kids are getting a much better education? And up to now, this was the dilemma .. No one really had that answer because no one really knew. No one had ever tried it before…. That was then. We now have results and can analyze this experiment and see, once and for all, how charter schools can impact the growth and development of our children!… This is truly awesome, actually!…. . In Philadelphia, the proportion of students attending charter schools jumped to 23 percent in the 2011-12 school year from 12 percent in 2004-5, according to the National Center for Education Statistics. The actual number of Charter School Students within the Philadelphia School District, according to the National Alliance for Charter Schools, is 47,800… just 950 student shy of the district’s empty seats…….. In all 23.4% of Philly’s children are enrolled in Charter Schools…. The district projects a 37 percent increase in costs associated with charter schools over the next five years, bringing the total charter cost to more than $800 million…. That will come out of the public school budgets. Last year, Philadelphia charters met AYP (Adequate Yearly Progress)at only 29 percent, yet that was still better than the 13 percent tally for Philadelphia’s district-run schools….. Mathematically that stacks up thusly…. Conclusion. Having charter schools and public schools duke it out over scarce resources, not unlike the recent movie Hunger Games, cuts our actual passing students down by almost half…. Romney says it will balance the budget…. Those three numbers will equal 0. $5 Trillion Plus $1 Trillion Plus $2 Trillion …. with no cuts (except Big Bird and Lehrer) will create a balanced budget. These guys are literally insane… The Queen in “Alice In Wonderland” had better logic…. 5 + 1 + 2 = 0 Really? Really? REALLY? REALLY? REALLY? And YOU are saying … Obama lost the Debate? There is just no way I can be the only person in this country who sees Obama just got Romney to lose this election. But of course, if all of you continue to focus on how well Mitt is doing, and fail to make THIS the issue, math that every American can understand, … well then, shame on you. It seems like only recently that atrocities are cropping up in Afghanistan. They may have been on going, but the rash today could be explained by the long years, and many repeat tours, which have taken a toll on our best and brightest. War is not grade school. War takes a toll. And using the same people over and over, would cause the breaking down of moral fiber. When you are in an impossible situation for a very long time, and it seems like it is such an absurd environment so that old rules don’t apply; you tend to take those old rules for granted. Instead you move yourself into a surreal world; one where your emotions impact your perception of reality. These atrocities are not new to mankind. If you haven’t fought, just going to the movies should give you enough perspective to understand why these men react they way they do. What’s different lately, is not that our men are acting like barbarians. Instead, it is that they are not acting to the highest standards possible. That is the norm for the US military. But after being there too long, they are acting like normal men. Like men in every other army. The same situation is occurring in our high schools. Currently Christina School District has three teacher incident investigations on going. Three. All three of these people would not doubt, still be teaching, had they not been forced to survive the bizarre environment that is high school for so long. An incident came up, and that part of us that constantly protects us from over reacting except in dire emergencies, released that pent up anger prematurely. We blame the teacher because it isn’t something all teachers are doing. However we need to look at the system, the way the military is looking at solving their problem. Which is that men have been fighting longer than WWII without a break. Our schools need more money, not cuts. We need to raise money. The General Assembly should double resources this year and raise tax rates to cover it. We’re done trying to stretch our schools thinner.. It is time to start building them back.